ADDIS ABABA, Mar 26 2014 (IPS) - The sign for Salem’s directs you off a busy road in Addis Ababa, down a side street to a compound where multiple pairs of feet move up and down working treadles, and wooden shuttles flit back and forth, as Ethiopian sheumanoch — weavers — ply their trade. Seated at their looms, most appear to be making scarfs, the majority of which are sold on site in a colourful shop. But a small number of scarfs are destined for shores and stores far away from Ethiopia. Ethiopia currently has 60 garment factories and 15 textile mills in operation, as the country tries to position itself as the next source country for the world’s clothing industry. Currently, increased international interest in Ethiopia’s centuries-old textile industry is seeing some of the world’s biggest companies investing in it. At the same time this interest is affording small-scale business like Salem’s, which employs 14 weavers, a chance to grow. Last week she exported 700 scarfs to London-based Rose & Rose, which sells designer scarves and accessories. It was only the second shipment, but she hopes it will become a regular order. 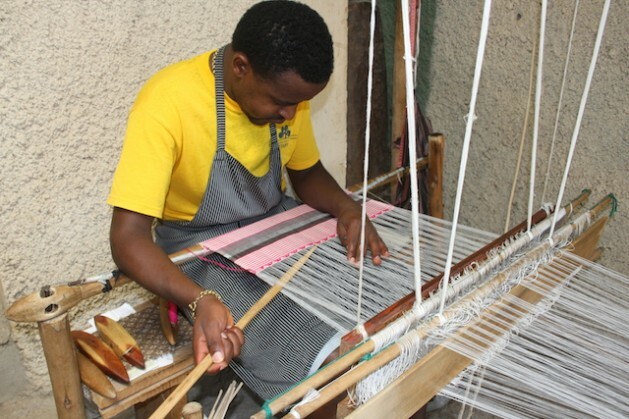 Five years ago, there was little interest in Ethiopia’s textiles, Salem says, but during the last three years queries from overseas have increased steadily. Larger domestic manufacturers appear to share her optimism. More buyers are being attracted as a result of increased international attention, Fassil Tadese, chief executive of MAA Garment and Textiles Factory, tells IPS. The MAA Garment and Textiles Factory, which is based outside Mekele, a city in northern Ethiopia, employs 1,500 workers, of which nearly 90 percent are women, and exports knitted garments to Europe and U.S.
Also, Fassil points out, manufacturers of auxiliary accessories and dyestuffs are coming, which is helping improve the local supply chain and access to materials. Trends and events on the global stage have impacted where large international textile manufacturers set up shop. The collapse of the Rana Plaza factory in Bangladesh last April, which killed more than 1,100 people, drew worldwide attention to the poor conditions of many Asian factories. At the same time, production costs in Asia are increasing, with salary increases easily outstripping inflation. And election-related violence in recent months has disrupted Bangladesh’s clothing industry, the second-biggest after China. In addition, strikes by garment workers in Cambodia, another major supplier, have increased pressure on global firms. Tesco, the world’s third-largest retailer, recently announced it expects to source more clothes from Ethiopia. Hennes & Mauritz, popularly known as H&M, the world’s second-biggest fashion retailer, also said it sees good opportunities for producing clothing in Ethiopia and across sub-Saharan Africa. Ethiopia currently has 60 garment factories and 15 textile mills in operation, as the country tries to position itself as the next source country for the world’s clothing industry, according to Tadesse Haile, state minister for Industry. Ethiopia’s new role as an awakening textile giant is helped by an abundance of cotton — millions of hectares suitable for growing cotton remain untapped — and labour, thanks to a population of about 90 million, with a large proportion under the age of 30. That this influx of foreign companies might squeeze out local manufacturers is not a concern, Fassil says. The massive textile market means there is plenty of room. So as international companies try diversifying from relying on Asian sourcing — H&M is one of the biggest buyers of garments from Bangladesh — Ethiopia increasingly appears to be a beneficiary. Tesco predicts that by 2014 and 2015 it will export about 1.5 to two million dollars of products from Ethiopia, increasing to about 11 million dollars by 2016 and 2017. At the same time, foreign companies are particularly sensitive about the need for regulated growth and ethically sound practices, so that mistakes made elsewhere in the world are not repeated. “It really matters to us that clothes are produced in good conditions and everyone involved is treated decently,” Giles Bolton, the ethical trading director at Tesco, tells IPS. Hence the company is engaging closely with the Ethiopian government and local business to ensure the long-term development of a well-regulated, ethical clothing industry, he adds. An advantage in Ethiopia is many suppliers have worker unions which ensure effective dialogue between workers and employers, Anna Eriksson, a spokesperson for H&M, tells IPS. At Salem’s the weavers appear content working away in the smart and breezy compound. But like most employees, they have concerns. Weaving is a difficult and physically demanding job, Samson Sesete, who has been a weaver for seven years, tells IPS. And they are paid per item, which means incomes vary, 21-year-old Teshome Onke, who began weaving at 14 in southern Ethiopia, tells IPS. Fast weavers can earn about 2,000 birr (110 dollars) per month, he says, though their slower companions average closer to 1,500 birr (81 dollars). And being paid for an item that is then sold for at least twice the cost appears a source of frustration. Salem says she discusses wages with the weavers, acknowledging how they always want to be paid more. “But then I wouldn’t be able to sell anything,” she points out. A 25 percent mark up in price covers overheads, Salem says. A further 65 percent is the maximum profit margin that could be added, and 30 percent of this goes to the government in taxes. Another challenge for a small business like hers is access to capital. Banks want to see collateral — colourful designs and ideas are not sufficient — and currently she doesn’t have enough. Across the road Salem has a second compound where she wants to employ dozens more weavers to grow the business. But currently it’s still too early to commit to expansion. “Although we are getting plenty of interest, I’m waiting to see whether questions turn into orders,” Salem says. And even if those orders come, she acknowledges that it will be hard work within the highly-competitive international market where order quotas must be delivered on time, every time.